I am heartbroken to update all staff that Deputy Derek Geer is in the final hours of his life. He is currently on life support at St. Mary’s Hospital while final arrangements are made for him to provide one last measure of service in the form of organ donation. I am told this could take up to 48 hours. We will not wait to begin to honor Deputy Geer and his sacrifice. Effective immediately and until further notice please shroud your badge in honor of Deputy Geer. We have posted a uniformed guard on Deputy Geer and will be providing a schedule of our needs if you would like to participate in guarding him. We will begin meeting with his family and working with them to understand their wishes and how we can support them. I will keep you updated as we develop plans with Deputy Geer’s family. Please continue to support each other and keep Deputy Geer’s family in your thoughts and prayers. I will continue to update as any new information is received. This has been a tragic and terrible day for the Mesa County Sheriff’s Office but I know if we support and care for each other we will eventually begin to heal. A Mesa County deputy suffered life-threatening injuries Monday morning after he was shot by a suspect he had stopped to conduct an investigation. The deputy, identified as Derek Geer, was shot multiple times. As of Monday night, he remained in the hospital and his condition is described as “grave”. Authorities say Geer confronted a 17-year-old who matched the description of the suspect with a gun. When the suspect was told he was being detained, the sheriff’s office says he tried to flee – prompting Geer to use his stun gun. The suspect then fired at Geer multiple times and ran away. Other deputies arrived and found Geer unresponsive. He was rushed to the hospital for treatment. Meanwhile, law enforcement officers from every other agency in the area helped search for the suspect. He was taken into custody less than an hour later. His identity has not been released. 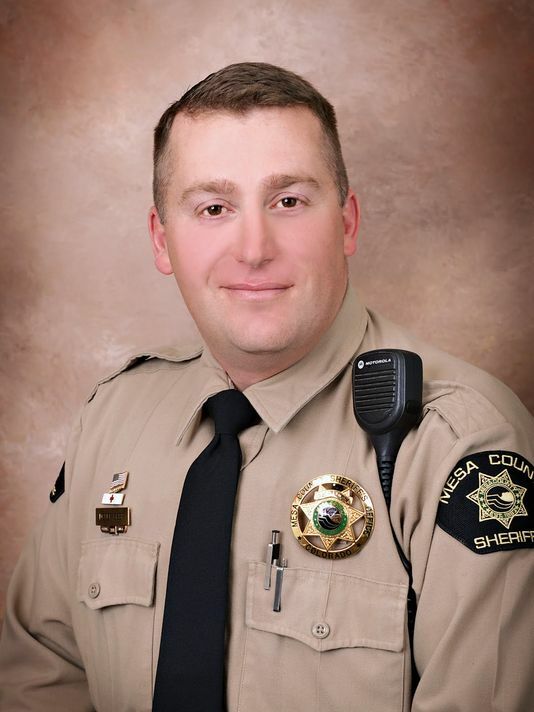 Deputy Geer is a Navy veteran who has been with the Mesa County Sheriff’s Office since October 2001. Cops lives matter. I grieve for this man and his family. MY PRAYER TO YOU MR OFFICER IF YOU NEED ANY ORGAN TO SURVIVE CONTACT ME!! Thank you Deputy Greer for your service to our country and your community. Rest in peace. Rest in peace, Deputy Greer. Your service and your sacrifice will not be forgotten. Dear God this world is a pit . Thank God this is not my home. Heaven is. I pray peace for this family. I am praying for this officer to receive a complete healing! Death penalty for those who shoot police officers!! This MUST stop! They are there to protect us and to do their job! If I was a cop, I guess I would have emptied out my clip on the evil SOB’s trying to harm others and myself! If he would have used his gun it would have been in the media that he shot a kid and he would have been the bad guy. It’s a double edge sword. He used his judgement as he was trained to do. My thoughts are w his family. As a former police officer and FBI firearms instructor the question begs to be asked did the deputy hesitate in using lethal force by using his ECD first, thus giving this guy the edge ? Not being critical of his actions in this particular circumstance; but in light of the policy statement set forth by the Police Executive Research Forum titled Use of Force: Taking Police to a Higher Standard, dated 1/29/2016, I am concerned that in the rush to be politically correct that we will forget that policies and procedures must be carefully crafted to protect the good guys as well as the bad guys. God bless officer, hope far a full and speedy recovery. As a current officer and field training officer, I am seeing more and more instances where officers hesitate for fear of being judged by 12. I can honestly say without knowing this situation, it is becoming a sad trend nation wide! Very well said. These were my thoughts exactly! If he shoots a 17-year-old that has a BB gun, the public will crucify him! We can sit here and debate all day on social media, but officers only have seconds to make a decision and react. God bless the family and the department.